Two of NASA's Great Observatories, the Spitzer and Hubble Space Telescopes, have teamed up to "weigh" the stars in several very distant galaxies. One of these galaxies, among the most distant ever seen, appears to be unusually massive and mature for its place in the young universe. This comes as a surprise to astronomers because the earliest galaxies in the universe are commonly thought to have been much smaller agglomerations of stars that gradually merged together to build large majestic galaxies like our Milky Way. "This galaxy appears to have 'bulked up' amazingly quickly, within the first few hundred million years after the Big Bang," says Bahram Mobasher of the Space Telescope Science Institute and the European Space Agency, a member of the team which discovered the galaxy. "It made about eight times more mass in stars than are found in our own Milky Way today, and then, just as suddenly, it stopped forming new stars. It appears to have grown old prematurely." The galaxy was pinpointed among approximately 10,000 others in a small patch of sky called the Hubble Ultra Deep Field. Thanks to the Hubble Space Telescope, this area is captured in the deepest images of the universe ever made by humankind at optical and near-infrared wavelengths. It is also within the deepest survey from the Spitzer Space Telescope, the Great Observatories Origins Deep Survey (or GOODS). The galaxy is believed to be about as far away as the most distant galaxies and quasars now known. The light reaching us today began its journey when the universe was only about 800 million years old. Scientists studying the Ultra Deep Field found this galaxy in Hubble's infrared images and expected it to be a very young "baby" galaxy, like others known at similar distances. Instead, they found a "teenager," much bigger than other galaxies known from this young cosmic era, and already quite mature." 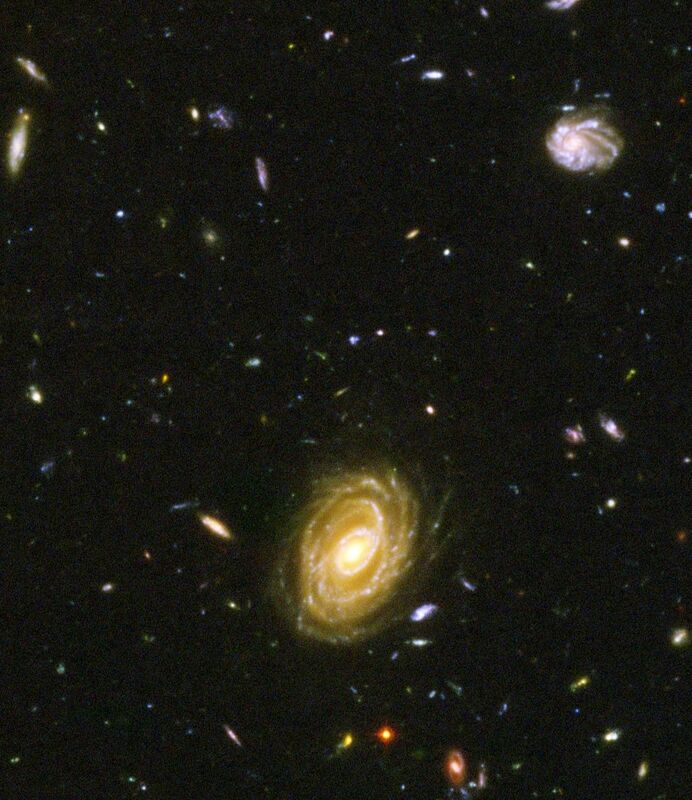 Hubble's Advanced Camera for Surveys (ACS) does not see the galaxy at all, despite the fact that the Ultra Deep Field is the deepest image ever taken in optical light. This indicates that the galaxy's blue light has been absorbed by traveling billions of light-years through intervening hydrogen gas (imagine trying to see the bottom of a silt-laden pond). 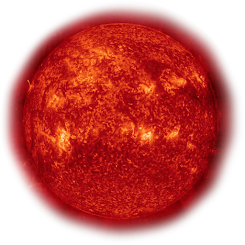 The galaxy was detected using Hubble's infrared camera, the Near Infrared Camera and Multi-Object Spectrometer (NICMOS), and also with an infrared camera on the Very Large Telescope (VLT) at the European Southern Observatory, but at those wavelengths it is very faint and red. However, the big surprise was how much brighter the galaxy is in images from Spitzer's Infrared Array Camera (IRAC), which easily detects it at wavelengths as much as five times longer than those seen by the Hubble. Spitzer's IRAC is sensitive to the light from older, redder stars which should make up most of the mass in a galaxy, and the brightness of the galaxy suggests that it is quite massive indeed. "This would be quite a big galaxy even today," says Mark Dickinson of the National Optical Astronomy Observatory (NOAO). "At a time when the universe was only 800 million years old, it's positively gigantic." The object is also well detected with Spitzer's Multiband Imaging Photometer (MIPS) which covers wavelengths fifteeen times longer than those of the Hubble, making it sensitive to energetic processes in galaxies. This observation is consistent with the object hosting a supermassive black hole at its center, if indeed it is this massive and was formed at this early stage in the history of the universe. The GOODS Spitzer observations have previously revealed evidence for mature stars in more ordinary, less massive galaxies at similar distances. Lawrence Eyles from the University of Exeter and collaborators, and Haojing Yan of the Spitzer Science Center, working with other members of the GOODS team, have published joint Spitzer and Hubble analyses that identify other galaxies nearly as massive as the Milky Way, seen when the universe was less than one billion years old. The new observations by Mobasher and his colleagues dramatically extend this notion of surprisingly mature "baby galaxies" to an object which is perhaps ten times more massive, and which seemed to form its stars even earlier in the history of the universe. Mobasher and his collaborators estimated the distance to this galaxy by combining the information provided by the Hubble, Spitzer, and VLT observations. Together, these observatories cover a wide swath of the electromagnetic spectrum, from visible to mid-infrared wavelengths (0.4 to 24 microns). The relative brightness of the galaxy at different wavelengths is influenced by the expanding universe, and allows astronomers to estimate its distance. At the same time, they can also get an idea of the make-up of the galaxy in terms of the mass and age of its stars. The team has tried to confirm the distance estimate with spectroscopic measurements from the largest ground-based telescopes, the VLT, Keck, and Gemini observatories, but the object has proven to be too faint for such observations. However, thanks to the many wavelengths at which the galaxy has been observed, the color signature appears to be unique, and the estimates of the distance and mass seem robust. "While we cannot completely discard other scenarios, this appears to be the most plausible interpretation, given the available data," says Henry C. Ferguson, a member of the team.